MIT researchers just unveiled a new three-dimensional solar array that can produce up to 20 times more energy per square foot than traditional flat arrays – and it’s potentially more efficient than standard arrays as well. The team tested multiple stacked PV panel configurations and settled upon a 3D shape that takes in the most light over time per area of ground. Their remarkable results (especially in cloudy weather) point to a promising way to apply solar panels to tall buildings and other structures without sacrificing space. MIT’s latest solar discovery also corroborates the hunch of Adien Dywer, the 13-year-old boy who hypothesized and tested a solar tree design. The researchers developed a software analysis tool which can test any type of solar configuration. The team took the most promising results and built models, which they tested in Boston. After a couple of cloudy weeks, the discontented group analyzed the data and found the accordion-like array outperformed a flat array significantly. The findings shows that capturing solar energy from differing angles is preferable in places that are often overcast or located at higher latitudes. The results prove out the theory of Adiean Dywer, who when he was 13 tested an array configuration based on trees. While his measurements were wrong because he measured voltage (which is static) and not amperage (which is actual energy), his insight proved to be dead-on. MIT’s energy modeling takes the concept a bit further by analyzing complex 3-dimensional shapes – for instance, a cube with an inward dimple would improve efficiency by 10-15% over a flat-faced cube. The panels would be most effective using thin film technologies, which are cheaper and more capable of producing energy in low light and shaded conditions. While that concave cube could be hard to manufacture, the accordion design will not be. As solar panel prices have fallen dramatically, the next challenge is improving energy density to the installation site. Imagine skyscrapers with curtain walls covered in these panels. Or stand alone towers perched above parking lots and roadways. The field of architecture could use the modeling tools to optimize building skins for solar gain. The report is published in Energy and Environmental Science, which states that that the designs can add 2 to 20 times the power density per area. Note this is not by volume and since towers close together would shade one another, this is primarily a design for urban environments, not open fields. Very nice. I'm interested in having a prototype, stacked PV array installed on my property. Great location for a demonstration site. Good visibility to the right type of people to drive this towards a viable production model. 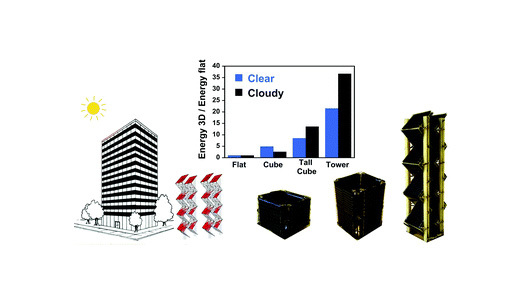 These 3D arrays are an exciting change since it produces so much more energy. Sustainable energy is the only real solution given the way we are polluting our environment with our current resources, which are quickly being depleted. Solar systems create clean, natural energy with absolutely no pollution. 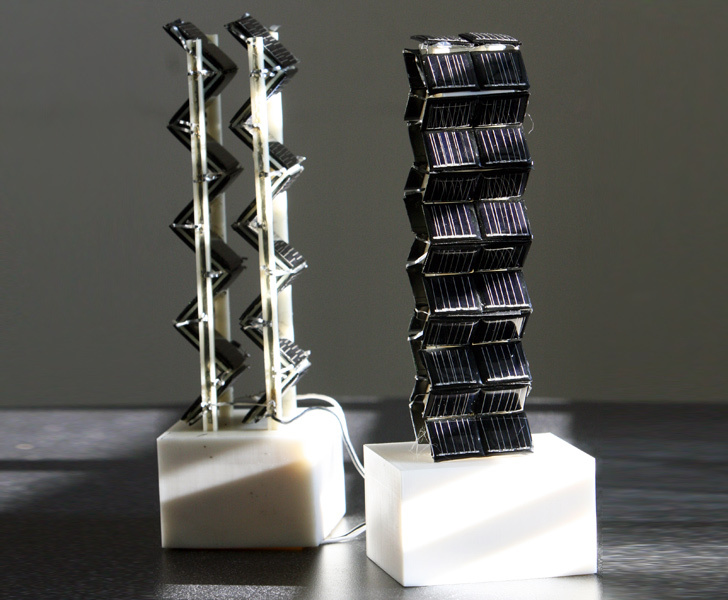 It can provide heat, lighting, mechanical power and electricity. I got an amazing lead on this topic when I found Greenlogic.com. They have some useful information regarding their costs and savings before and after tax incentives and credits and utility rebates. These tax breaks alone can make it easier for you to afford a system. They had information on renewable energy solutions that really helped me come up with a useful strategy. I knew the initial cost of my solar system and the expected lifetime savings. It made the decision quick and easy. You should take a look. Good job, Aidan! 13 years old and he has inspired the next generation of solar panel design. MIT researchers just unveiled a new three-dimensional solar array that can produce up to 20 times more energy per square foot than traditional flat arrays - and it's potentially more efficient than standard arrays as well. The team tested multiple stacked PV panel configurations and settled upon a 3D shape that takes in the most light over time per area of ground. Their remarkable results (especially in cloudy weather) point to a promising way to apply solar panels to tall buildings and other structures without sacrificing space. MIT's latest solar discovery also corroborates the hunch of Adien Dywer, the 13-year-old boy who hypothesized and tested a solar tree design.